Gaza City – The rooms of the al-Amal Institute for Orphans in Gaza City could belong to any child, with Donald Duck stickers plastered to the walls and stuffed teddy bears arranged in rows upon tidy bedspreads. But the brightness is a facade: These children draw war. They sketch rockets and Israeli fighter jets, pictures of people shattering into pieces, because this is what they know. “Whenever I hear aeroplanes, I get scared,” eight-year-old Aisha al-Shinbary tells Al Jazeera, curling her legs underneath her on a cushion in one of Amal’s common rooms. Aisha arrived at Amal several years ago after her father died naturally and her brother was killed in an Israeli air strike. Her mother could no longer care for all the children.During the 2014 war, the orphanage sent all its children to live with relatives while the facility was temporarily opened up as a shelter for hundreds of displaced Gazans. Aisha returned to live with her mother, but shortly afterwards, her mother, too, died in an Israeli air strike. Today, Aisha’s mother comes to her only in dreams. She kisses and hugs her little girl, and then she disappears. Aisha wakes up, orphanage administrators say, and she draws rockets. Aisha’s story is not unusual in the besieged Gaza Strip, where a 51-day Israeli assault killed more than 2,200 Palestinians this summer and injured scores more. 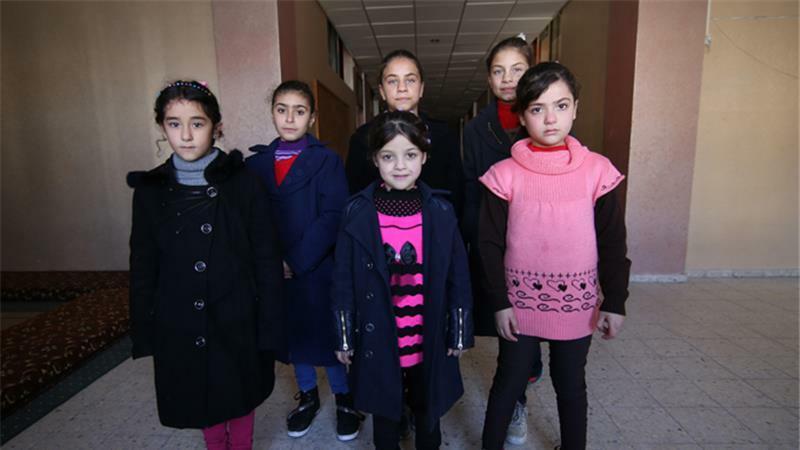 The 2014 war created more than 1,500 new orphans, in addition to tens of thousands already living in Gaza, says Abed Almajed Alkhodary, chairman of Amal’s board of directors. The orphanage – which was founded more than six decades ago and remains the sole facility for orphans in Gaza City – takes only the neediest children; it cannot accommodate all the city’s orphans. “Some orphans here watched their families and mothers die in front of them,” Alkhodary tells Al Jazeera. After the 2014 war, the number of orphans residing at Amal nearly doubled to 150, the highest number in the orphanage’s history, board member Kamal Meqbin tells Al Jazeera – and that number is expected to rise further throughout the year. The centre, which is funded privately, is being renovated and expanded to accommodate the influx, while a staff of more than 50 works around the clock to monitor, feed, teach, play and comfort Amal’s young residents. “The psychological situation for a kid whose family was killed, who went to buy something and came home to find his family dead – this is the worst you can see,” Meqbin said, noting many orphans struggle with deep-seated psychological issues and crippling anxiety. Ten-year-old Nawal Yassine has been living at Amal since October. Before her father died, she says, the Israelis called her uncle, a Hamas member, who gave the phone to her father. “What do you want from my brother?” her father demanded, according to Nawal’s retelling. “Wherever you hide your brother, we’ll be following, and we will kill him,” the voice at the other end of the line replied. “My father told the Israelis, ‘We will come to Tel Aviv and step on your necks,'” Nawal tells Al Jazeera, a touch of pride lighting up her otherwise solemn face. Orphanage administrator Rewayda Kassab gently intervenes to explain that this did not really happen; it is a fiction Nawal’s mother created so that her children would remember their father as a hero. He died after shrapnel from a missile embedded in his heart, and while en route to hospital, another bomb struck the car. He was later identified only by the distinctive jalabiya he wore. Manal Abu Taiema, 11, from Khan Younis, also vividly recalls her father’s death. She remembers him calling out: “Don’t get close to the windows.” Moments later, two missiles hit their home. As she speaks, she repeatedly wrings her hands, a gesture mirrored by her older sister, who listens nearby. Down another hallway, Yussef al-Shinbary, 14, pulls up his pant leg to reveal an ugly shrapnel scar on his ankle, inflicted after the Israelis bombed the UN school where his family had been sheltering. His sister lost both her legs in the attack and was sent to Turkey for treatment. Some children at Amal build Lego towers and houses, Kassab says, in a symbolic nod to the ones that were destroyed. Others train with Mahmoud Eid, an artist and an orphan himself, who is now in his early 20s. The orphanage has a hall devoted to Eid’s work: Palestine maps carved in wood, sculpted clay pots, paintings of abstract landscapes and ghostly faces. Some of the children’s artwork is displayed here, too – but not the darkest pieces. Here, the orphanage showcases suns and sailboats, colourful paintings on glass. It is an affirmation that there is still brightness in these children’s lives. Over time, orphans’ memories of their lives and families before the war may become more distant, Meqbin said, but they never go away. “No one forgets, especially the child. The child will never forget his family. [All Palestinians] still remember 1948 and our lands being taken.